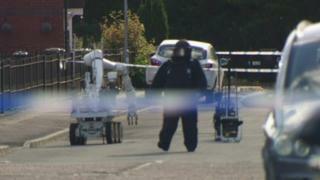 A viable pipe bomb has been found during a security in north Belfast. Police were called to Stanhope Street at about 12:50 BST on Saturday after a suspicious object was discovered. A number of residents were moved from their homes while the object was examined by army technical officers. They have now been allowed to return. Det Sgt McPhillips thanked the community for their patience during the operation and appealed for anyone with information to come forward. In a separate incident, a second security alert is under way after a suspicious object was found in Derrycoole Way, Newtonabbey, on Saturday evening. A number of people have been moved from their homes and placed in temporary accommodation at the Valley Leisure Centre.